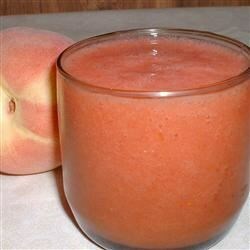 "This is a great smoothie consisting of fruit, fruit juice and ice. I like to use whatever fresh fruits I crave that day. Any kind of berry, mangos, papayas, kiwi fruit, et cetera make a great smoothie. Experiment with your favorites!" Fresh fruit, fruit juice, and ice—that’s all there is to it! Only O.K. It just tasted like a lot of fruit blended together. Not very smooth, not very sweet. Will look for another smoothie recipe next time. I've been making them with blueberries, raspberries, strawberries, a banana and apple juice and it is stiff competition for my favorite juice bars 'banana berry' flavor! Delicious recipe! We scaled it down to 2 servings and used frozen strawberries & bananas, orange juice, and a 4oz can of peaches in heavy syrup. We left out the ice. We will make this again. Enjoy how adaptable this recipe is to almost any fruit combination. Thanks for sharing. This was a great recipe. Thanks for submitting.